Must Every Disciple Make an Abrahamic Sacrifice? Cover image: Abraham Taking Isaac to be Sacrificed by Del Parson. Figure 1. Rembrandt Harmenszoon van Rijn (1606-1669): The Sacrifice of Isaac. Question: In his willingness to offer up Isaac in sacrifice, Abraham made an unthinkable choice — a choice that opposed reason,[ii] went contrary to the commandments,[iii] seemed to nullify God’s prior promises,[iv] and must have made his whole soul recoil in moral repugnance. [v] Does the Lord require every disciple to make a similar choice? Figure 2. Jacques Joseph Tissot (1836-1902): God’s Promises to Abram. What can we learn from Abraham’s response? That the sign of absolute faith is not found in the gross sequence of motions that outwardly proclaim obedience, but in the subtleties of a perfect inner grace that accompanies their performance, an authentic, loving response to a divine call whose flawless pose is unappreciated by ordinary observers but not unseen by God. For example, consider this close-up of the decorations located immediately above the Torah niche in the late second century Dura Europos synagogue. [xlix] The entire panel is rich with symbols of resurrection and eternal life: the menorah as a stylized Tree of Life (left), a representation of the doors of the Temple in Jerusalem (center), and the sacrifice of Isaac by Abraham (right). In front of the altar on which Isaac is lying, a ram caught in a tree is shown. In the background is what appears, at first glance, to be someone in a tent. Although the figure in the background is sometimes identified as Sarah,[l] women in the other Dura murals are always shown wearing colored clothing. Besides, it is difficult to see why Sarah would have been pictured at the scene of sacrifice. In light of the tradition that, in Isaac’s experience on Mount Moriah, he died, ascended to heaven, and was resurrected, Margaret Barker[li] interprets the figure standing at an entrance as “going up behind a curtain held open by a disembodied hand — the symbol of the lord [shown immediately to the left of the curtain]. Since the temple curtain [veil] represented access to the presence of God, this seems to depict Isaac going to heaven.”[lii] Going further, it must be observed that Barker’s description actually raises not one but three interpretive possibilities: 1. an actual death and resurrection; 2. a temporary ascent to the heavenly temple (as when Abraham received God’s sure promise); and 3. a figurative entry into God’s presence through ritual. The test of Sarah. Although Sarah’s role is backgrounded in the story of Isaac’s near-sacrifice, she is front and center in Genesis 12 and 20 where she is twice taken as a prospective wife by foreign rulers Pharaoh and Abimelech. Tissot’s painting shows Sarah’s understandable discomfort with being ogled at close range by the passing men of Pharoah’s court. Figure 9. Jaques Joseph Tissot (1836-1902): Abram’s Counsel to Sarah. [T]he stories of Isaac and Sarah teach us that salvation is a family affair, in which, however, each member acts as an individual and makes his own choice, for each must decide for himself when it is a matter of giving up all things, including life itself, if necessary. But “when the Lord has thoroughly proved him, and finds that the man is determined to serve Him at all hazards,” only then “the visions of the heavens will be opened unto him,” as they were to Abraham, “and the Lord will teach him face to face, and he may have a perfect knowledge of the mysteries of the Kingdom of God.” If Abraham knew that “God would provide a sacrifice,” Isaac did not; if he was perfectly sure of his wife, she was not and prayed desperately for help — husband, wife, and son each had to undergo the terrible test alone. Going further, Riley shows how Hagar’s narrative also deeply resonates with parallel stories of additional prophets besides Abraham. He finds significant patterns of allusions to Hagar’s story in the Exodus narrative[lxvii] as well as the story of Elijah. [lxviii] These all go to show that Paul’s contrast in Galatians 4:22-31 between Hagar (the “bondmaid”) and Sarah (the “freewoman”) as an allegory describing the difference between Judaism and Christianity should be taken as useful rhetorical fodder, not as a literal characterization of Hagar herself as an individual. [lxix] Rather, Hagar, in company with the prophets Abraham, Moses, and Elijah, can be seen as an exemplars sharing a common model of faithfulness and eventual reward after trial. This is not all, however. In the casting out and redemption of Hagar, Smith argues that “the author of the Hagar passages wanted to draw attention back to the earlier story of Adam and Eve in the Garden. … It is plain that the author of the story wanted Hagar to be seen as a parallel to the great mother figure,”[lxx] Eve — thus becoming a model for following the road of return to to the presence of God for each of Eve’s daughters and sons. Abraham had gone far enough; he had proven to himself and the angels who stood witness (we are told) that he was actually willing to perform the act. Therefore the Lord was satisfied with the token then, for he knew the heart of Abraham. This is the same for Isaac and Sarah [and Hagar] and for us. And whoever is willing to make the sacrifice of Abraham to receive eternal life will show it by the same signs and tokens as Abraham, but he or she must do it in good faith and with real intent. 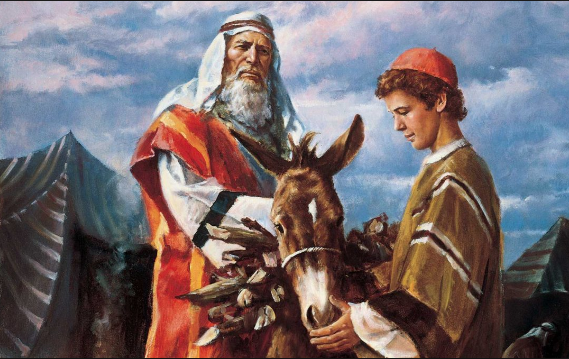 For a related discussion, see Book of Mormon Central, “How Abraham’s Sacrifice of Isaac Illuminates the Atonement” KnoWhy 412 (February 2018), to appear. See also Book of Mormon Central, “What Does It Really Mean to be Blessed for Keeping the Commandments?” KnoWhy 367 (September 26, 2017). https://knowhy.bookofmormoncentral.org/content/what-does-it-really-mean-to-be-blessed-for-keeping-the-commandments. For a scripture roundtable video from The Interpreter Foundation on the subject of Gospel Doctrine lesson 9, see https://www.youtube.com/watch?v=mSDXCiHEqqg. Annika Sheaff Grand Jeté. In Riverside-Brookfield Landmark. https://www.rblandmark.com/Directory/Resources/Academy-of-Movement-and-Music/Photos/11609/. (accessed February 26, 2018). Attridge, Harold W., and Helmut Koester, eds. Hebrews: A Commentary on the Epistle to the Hebrews. Hermeneia—A Critical and Historical Commentary on the Bible, ed. Frank Moore Cross, Klaus Baltzer, Paul D. Hanson, S. Dean McBride, Jr. and Roland E. Murphy. Philadelphia, PA: Fortress Press, 1989. Barker, Margaret. Temple Themes in Christian Worship. London, England: T&T Clark, 2008. Bradshaw, Jeffrey M. “The Ezekiel Mural at Dura Europos: A tangible witness of Philo’s Jewish mysteries?” BYU Studies 49, no. 1 (2010): 4-49. Bradshaw, Jeffrey M. Temple Themes in the Oath and Covenant of the Priesthood. 2014 update ed. Salt Lake City, UT: Eborn Books, 2014. Burton, Alma P. Karl G. Maeser, Mormon Educator. Salt Lake City, UT: Deseret Book, 1953. Dunnill, John. 1992. Covenant and Sacrifice in the Letter to the Hebrews. Society for New Testament Studies Monograph Series 75. Cambridge, England: Cambridge University Press, 2005. Eisenbaum, Pamela Michelle. The Jewish Heroes of Christian History: Hebrews 11 in Literary Context. Society of Biblical Literature Dissertation Series 156, ed. Michael V. Fox and Pheme Perkins. Atlanta, GA: Scholars Press, 1997. Eyring, Henry B. “The Lord leads His church.” Ensign 47, November 2017, 81-84. https://www.lds.org/general-conference/2017/10/the-lord-leads-his-church?lang=eng. (accessed February 25, 2018). Givens, Terryl L., and Blair Hodges. 2017. Feeding the Flock, with Terryl L. Givens (8 December 2017). In MIPodcast #74, Neal A. Maxwell Institute for Religious Scholarship, Brigham Young University. https://mi.byu.edu/mip-74-givens/. (accessed February 25, 2018). Hafen, Bruce C. A Disciple’s Life: The Biography of Neal A. Maxwell. Salt Lake City, UT: Deseret Book, 2002. ———. Spiritually Anchored in Unsettled Times. Salt Lake City, UT: Deseret Book, 2009. Hurst, L. D. The Epistle to the Hebrews: Its Background of Thought. Society for New Testament Monograph Series 65. Cambridge, England: Cambridge University Press, 1990. Johnson, Luke Timothy. Hebrews: A Commentary. The New Testament Library, ed. C. Clifton Black and John T. Carroll. Louisville, KY: Westminster John Knox Press, 2006. Kierkegaard, Soren. 1843. Fear and Trembling: A Dialectical Lyric. Translated by Walter Lowrie. Princeton, NJ: Princeton University Press, 1941. Koch, Joni L. “Apart, but still one.” Ensign 47, November 2017, 110-11. https://www.lds.org/general-conference/2017/10/apart-but-still-one?lang=eng. (accessed February 25, 2018). Kraeling, Carl H., C. C. Torrey, C. B. Welles, and B. Geiger. The Synagogue. The Excavations at Dura-Europos Conducted by Yale University and the French Academy of Inscriptions and Letters: Final Report VIII, Part I. New Haven, CT: Yale University Press, 1956. Kramer, Nathaniel. “August Bournonville: Kierkegaard’s leap of faith and the ‘noble art of terpsichore’.” In Kierkegaard and His Danish Contemporaries, edited by Jon Bartley Stewart. Vol. 3: Literature, Drama, and Aesthetics, 70-81. Farnham, Surrey, England: Ashgate, 2009. Lane, William L. Hebrews 9-13. Word Biblical Commentary 47B, ed. David A. Hubbard, Glenn Barker, W. and John D. W. Watts. Nashville, TN: Thomas Nelson, 1991. Liebman, Laura. Gravestone symbols: The hand of God. In Early American Graveyard Rabbits. https://colonialgyrabbit.blogspot.com/2010/03/gravestone-symbols-hand-of-god.html. (accessed July 30, 2010). Madsen, Truman G. “Power from Abrahamic Tests.” In Five Classics by Truman G. Madsen, edited by Truman G. Madsen, 232-. Salt Lake City, UT: Deseret Book, Eagle Gate, 2001. Maxwell, Neal A. A Time to Choose. Salt Lake City, UT: Deseret Book, 1972. Nibley, Hugh W. “The sacrifice of Isaac.” In Abraham in Egypt, edited by Hugh W. Nibley and Gary P. Gillum. The Collected Works of Hugh Nibley 14. Salt Lake City, UT: Deseret Book, 2000. https://publications.mi.byu.edu/fullscreen/?pub=1093&index=11. (accessed July 26, 2016). ———. “The sacrifice of Sarah.” In Abraham in Egypt, edited by Hugh W. Nibley and Gary P. Gillum. The Collected Works of Hugh Nibley 14. Salt Lake City, UT: Deseret Book, 2000. https://publications.mi.byu.edu/fullscreen/?pub=1093&index=12. (accessed February 25, 2018). ———. 1986. “Return to the temple.” In Temple and Cosmos: Beyond This Ignorant Present, edited by Don E. Norton. The Collected Works of Hugh Nibley 12, 42-90. Salt Lake City, UT: Deseret Book, 1992. https://publications.mi.byu.edu/fullscreen/?pub=1123&index=5. (accessed July 26, 2016). Riley, Jonathon M. “Two views of the foreign woman: Inner biblical allusion in the Elijah narrative.” 2018. Shakespeare, William. The Riverside Shakespeare. Boston, MA: Houghton Mifflin Company, 1974. Smith, Andrew C. “Hagar in LDS scripture and thought.” Interpreter: A Journal of Mormon Scripture 8 (2014): 87-137. https://www.mormoninterpreter.com/hagar-in-lds-scripture-and-thought/. (accessed February 25, 2018). Taylor, John. 1883. “Discourse by President John Taylor. Delivered at Parowan, Sunday Morning, June 24, 1883. Truth always the same; duties of the Saint; officers prsent; where the principles of the Gospel originated; character of Abraham; how he was tried; his progeny; duties of the priesthood; trials of the Saints; charity required; how transgressors should be dealt with; exhortation to righteousness.” In Journal of Discourses. 26 vols. Vol. 24, 259-70. Liverpool and London, England: Latter-day Saints Book Depot, 1853-1886. Reprint, Salt Lake City, UT: Bookcraft, 1966. ———. 1883. “Discourse by President John Taylor. Delivered in the Bowery, Deseret, Monday, June 18, 1883. Scope of the gospel; different degrees of glory; free agency; “liberty” with a vengeance; trials necessary; former and latter trials; the spirit of gathering illustrated; judgments predicted; Zion already attracting attention; encouragement for the citizens of Deseret; blessings invoked.” In Journal of Discourses. 26 vols. Vol. 24, 194-202. Liverpool and London, England: Latter-day Saints Book Depot, 1853-1886. Reprint, Salt Lake City, UT: Bookcraft, 1966. Webster, Noah. An American Dictionary of the English Language in Two Volumes. New York City, NY: S. Converse, 1828. https://archive.org/details/americandictiona02websrich. (accessed August 15, 2017). [ii] No explanation was given for the divine injunction to sacrifice Abraham’s beloved son. [iii] The idea of child sacrifice was condemned in ancient Israel (e.g., Leviticus 20:2-5; 1 Kings 11:4-11; 2 Kings 21:6; 2 Chronicles 28:1-4; Jeremiah 32:35-36). [iv] The greatest promise Abraham had received was posterity through Sarah and his son Isaac. [v] “Abraham had left a culture where human sacrifices was performed” (T. G. Madsen, Power). See Abraham 1:7-15. [vii] N. A. Maxwell, Choose, p. 46. [viii] Cited in B. C. Hafen, Disciple’s Life, p. 20. [x] B. C. Hafen, Anchored, pp. 28, 29. Figure with permission of Liz Lemon Swindle. [xi] Lectures on Faith 6:11. [xii] Lectures on Faith 6:3. See Hebrews 10:34. [xiii] T. G. Madsen, Power. [xv] J. Taylor, 24 June 1883, p. 264. I recite the experience of the founder of [Brigham Young] University, Dr. Karl. G. Maeser. He had been the headmaster of a school in Dresden-a man of distinction, a man of high station. In 1856, Brother Maeser and his wife and small son, together with a Brother Schoenfeld and several other converts, left Germany bound for Zion. When they arrived in England Brother Maeser was surprised to be called on a mission in England. Much to their disappointment the families were separated and the Schoenfelds continued on to America. While the Maesers remained in England to fill the call from the Church Authorities, the proud professor was often required to perform menial tasks to which in his former station he had never stooped. It was customary among the higher German people that a man of Brother Maeser’s standing never should be seen on the street carrying packages, but when the elders were going to the train they told him to bring their carpet bags. Brother Maeser paced the floor of his room, his pride deeply hurt. The idea of carrying the suitcases was almost more than he could stand and his wife was also deeply hurt and upset to think that he had to do so. Finally he said, ‘Well, they hold the priesthood; they have told me to go, and I will go.’ He surrendered his pride and carried the bags. [see A. P. Burton, Maeser, p. 11]. [xvii] Elder Jony L. Koch reminds us that “we have no right to portray anybody, including from our Church circle, as a badly finished product! Rather, our words about our fellow beings should reflect our belief in Jesus Christ and His Atonement and that, in Him and through Him, we can always change for the better!” (J. L. Koch, Apart, pp. 110-111). The Lord’s leadership of His Church requires great and steady faith from all who serve Him on earth. For instance, it takes faith to believe that the resurrected Lord is watching over the daily details of His kingdom. It takes faith to believe that He calls imperfect people into positions of trust. It takes faith to believe that He knows the people He calls perfectly, both their capacities and their potential, and so makes no mistakes in His calls. That may bring a smile or a shake of the head to some in this audience — both those who think their own call to serve might have been a mistake as well as those who picture some they know who seem poorly suited to their place in the Lord’s kingdom. My counsel to both groups is to delay such judgments until you can better see what the Lord sees. The judgment you need to make, instead, is that you have the capacity to receive revelation and to act on it fearlessly. [xviii] T. L. Givens et al., Feeding the Flock Podcast. Of course, one cannot allow room for acceptance of the seemingly irrational in God’s commands to sincere disciples without also opening the door to the illusions of the psychotic and the false pretensions of the conscious deceiver. [xix] That God couches his request as an entreaty rather than a command allows Abraham to witness that his willingness to comply springs from love rather than obligation. Nahum Sarna explains that the Hebrew phrase translated in Genesis 22:1 as “Take now thy son” “adds the participle naʾ to the imperative, which usually softens the command to an entreaty, as noted in Sanhedrin 89b, Genesis Rabba 55:7, and Rashi’s commentary. Abraham has absolute freedom of choice. Should he refuse, he would not incur any guilt” (N. M. Sarna, Genesis, Genesis 22:1). [xxi] Ibid., The Akedah: The Binding of Isaac. [xxiii] President Hugh B. Brown, cited in T. G. Madsen, Power, p. 232. [xxiv] C. Broderick, Dare, p. 119. For more on this theme, see J. M. Bradshaw, Temple Themes in the Oath, pp. 50-52. [xxv] T. G. Madsen, Power. See Hebrews 11:19, and additional commentary on that verse later in this article. [xxvi] N. M. Sarna, Genesis, Genesis 22:3. [xxvii] My appreciation to Arthur Henry King (1910-2000) for this unpublished insight concerning Genesis 22:3. [xxviii] Annika Sheaff Grand Jeté, Annika Sheaff Grand Jeté. [xxxii] N. Kramer, August Bournonville, p. 74. See also ibid., p. 73: The shape of the ballet leap, in the way that it connects earth to earth, calls to mind the bridging of heaven and earth characteristic fo faith. The balletic leap as a leap of faith thus unifies in the moment of its performance the temporal and the divine. [xxxvi] N. M. Sarna, Genesis, Genesis 12:1. [xxxvii] Ibid., The Akedah: The Binding of Isaac, emphasis added. See Genesis 22:2. [xxxviii] See Hebrews 6:13, 15. See D. A. Bednar, Faithful Parents for an apostolic correction of this misunderstanding. [W]hen God announced the blessings, it was not just by promise but by oath, as emphasized by the letter to the Hebrews: “When God made promise to Abraham, because he could swear by no greater, he sware by Himself.… And so, after [Abraham] had patiently endured, he obtained the promise” (Hebrews 6:13, 15). So what did it mean for the Almighty to swear by Himself? God was really saying, according to the Midrash, “Even as I live and endure for ever and to all eternity, so will My oath endure for ever and to all eternity” (citing Kasher, Encyclopedia of Biblical Interpretation, 3:160). It was the unconditional promise of eternal life, his calling and election made sure, which, says Joseph Smith, comes to a man after “the Lord has thoroughly proved him, and finds that the man is determined to serve him at all hazards” (J. Smith, Jr., Teachings, 27 June 1839, p. 150). Accordingly, explained Joseph Smith, it was “the power of an endless life… which; Abraham obtained by the offering of his son Isaac” (J. Smith, Jr., Words, 27 August 1843, p. 245), an event that “shows that if a man would attain to the keys of the kingdom of an endless life, he must sacrifice all things” (J. Smith, Jr., Teachings, 27 August 1843, p. 322). The rabbis stated that at the beginning of the great trial, when God had first called Abraham’s name and he had answered “Here am I,” the real meaning was “Here am I—ready for priesthood, ready for kingship, and he attained priesthood and kingship” (H. Freedman et al., Midrash, Vayera 55:6, 1:486). Similarly, Joseph Smith stated that by the “oath of God unto our Father Abraham,” his children were “secured [to him] by the seal wherewith [Abraham had] been sealed” (J. Smith, Jr., Words, 13 August 1843, p. 241). In the greatest irony of Abraham’s life, only by binding Isaac for the sacrifice had Abraham bound him to himself in the eternal bonds of priesthood sealing. [xl] Paraphrasing E. D. Clark, Blessings, p. 218. [xlii] T. G. Madsen, Power. [xliv] L. T. Johnson, Hebrews, p. 295, explaining the Greek behind the phrase in Hebrews 11:9 stating that Abraham receive Isaac “in a figure” (i.e., “figuratively speaking” (J. Dunnill, Covenant, p. 178): “The phrase en parabole points in two directions. Abraham received Isaac ‘back’ literally, when God stopped the sacrifice and Isaac was able to accompany his father home … As in the use of the same phrase in 9:9, however, the author may also imply another symbolic dimension, namely the resurrection from the dead that occurred in Christ and is anticipated by believers.” On the connection between Hebrews 11 and Romans 4, see L. D. Hurst, Epistle to the Hebrews, p. 121. [xlv] See, e.g., H. W. Attridge et al., Hebrews, p. 335 n. 25; W. L. Lane, Hebrews 9-13, p. 363. [xlvi] See, e.g., W. L. Lane, Hebrews 9-13, p. 362. [xlvii] H. W. Nibley, Sacrifice of Isaac. [xlviii] C. H. Kraeling et al., Synagogue, plate 51. [xlix] J. M. Bradshaw, Ezekiel Mural, pp. 11-12. [l] See, e.g., E. R. Goodenough, Dura Symbolism, 9:67–77. [li] M. Barker, Temple Themes, p. 28. [lii] Others have interpreted the divine hand as “staying the sacrifice” of Isaac (e.g., L. Liebman, Gavestone). [liii] P. M. Eisenbaum, Hebrews 11, p. 162 observes that the motif of a “near-death experience” of the hero appears more than once in Hebrews 11. In the case of Isaac: “What is stressed is that from one who was almost never born, and who after being born was almost killed, the descendants of Abraham, the descendants of God’s faithful ones, are born” (ibid., p. 163). [liv] H. W. Attridge et al., Hebrews, p. 335. Cf. J. M. Bradshaw et al., By the Blood Ye Are Sanctified, pp. 176-179. [lv] G. A. Rendsburg, Redaction, p. 28. [lvi] For details of parallels between the two accounts of Sarah’s ordeals, see ibid., pp. 35-38. [lvii] According to Nibley, various features in the two stories of Sarah indicate that we are “dealing here with ritually conditioned events rather than unique historical occurrences” (H. W. Nibley, Sacrifice of Sarah). See J. M. Bradshaw et al., Investiture Panel, p. 41 for a discussion of how rituals and accompanying variants of myths used to explain them may evolve through time, subject ot caveats such as those raised in R. A. Oden, Jr., Bible without Theology, pp. 65, 69. [lviii] H. W. Nibley, Sacrifice of Sarah. [lxi] A. C. Smith, Hagar. [lxii] J. M. Riley, Two views of the foreign woman: Inner biblical allusion in the Elijah narrative. [lxiii] A. C. Smith, Hagar, p. 90. [lxvi] N. M. Sarna, Genesis, The Akedah: The Binding of Isaac. See also the list of parallels in J. M. Riley, Two views of the foreign woman: Inner biblical allusion in the Elijah narrative, p. 1. [lxvii] J. M. Riley, Two views of the foreign woman: Inner biblical allusion in the Elijah narrative, pp. 1, 3-8. [lxviii] Ibid., pp. 2, 12-17. [lxix] See the analysis of A. C. Smith, Hagar, pp. 100-103. [lxxi] H. W. Nibley, Return, p. 59.